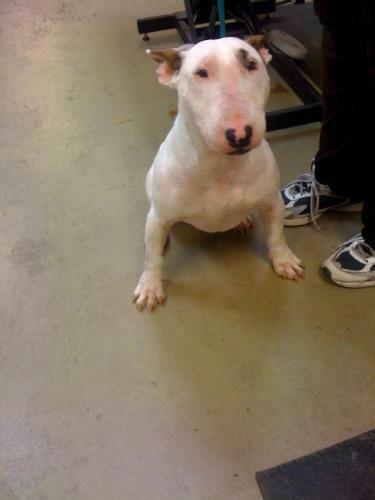 Serenity is a 2 year old deaf female bull terrier. 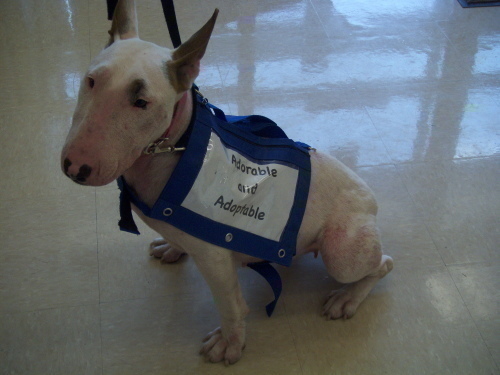 Serenity is a pleasure to be around and understands a lot even with her being deaf. Serenity loves to play with toys, go on walks, and be a complete cuddle bug if one just wants to sit back and watch a movie. Serenity loves attention and gets along well with other dogs we would just prefer for them to be bigger due to her trying to play a little rough sometimes with smaller dogs. Serenity is currently in foster care and is doing great. Also Serenity is housebroken, crate trained, spayed, comes up to date on shots, and micro chipped. Serenity is also current on heart worm preventative. Serenity is looking for her forever home so if one is interested in adopting Serenity please fill out a application by clicking the link at the top of her bio. ADOPTION FEE: $65.00 REVIEWED AND UPDATED 01-21-11 Serenity is exclusively fed Natural Balance Ultra Premium Dog Food!